This honour goes to the Lovely Lee Grant star of stage and screen (and actress Dinah Manoff’s mum). As you know I do love a good guilty pleasure, especially a disaster movie. And it was while rewatching The Swarm (1978) and Airport 77 (1977), I noticed this Oscar Winning and much nominated Actress, the lovely Lee Grant. In the latter I loved her delightful performance as the plane hit the murky depths of the Bermuda Triangle. And our heroine’s husband – played by the wonderful Christopher Lee – conveniently turned out to be a diver. And she was having an affair with Buck Rogers Gil Gerard. And the rest is pure hokum, but so love at least one of you to review this fab movie. And then to my joy I discovered her also in Damien: Omen II (1978) with William Holden and of course, Damien aka the seed of the Devil in this wonderful fun horror. It was around then I asked Chris from Angelman’s Place if he wanted to join me in this tribute to this wonderful actress. 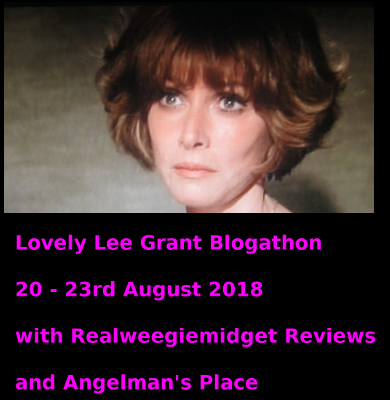 And he said yes, so.. I’m now officially inviting you to the Lovely Lee Grant Blogathon which will be held from the 20th to 23rd August 2018, with the final day for any lateRcomers due to time differences, illness or just wanting to be fashionably late (and a wee wrap up..). You are welcome to review about her work as an author, actress or director. And HERE is a link to that Who’s Doing What page.. where I will list all the bloggers and their entries. And love you lovely lot of bloggers to join me….or anyone else who wants to celebrate Lee Grant. You can review ANY of her films or TV shows. We will allow just the three duplicates for each topic, movie or TV Show. I won’t accept posts which are uncomplimentary or disrespectful to Lee Grant or her work. You can use previously published posts or reviews. You can also add podcasts on her or her work but only if you send me the podcast link by my Contact Me page. Note we will be publishing all the links on both our sites. And tune in August for the first of these posts. Hello, first, I need to apologize. I was not able to get a new review of WHEN YOU COMING BACK RED RYDER completed for the blogathon due to an untimely death in the family. However, it’s OK with you, I’d still like to participate and will just republish a review of a Made for TV movie starring Lee Grant and James Franciscus called NIGHT SLAVES. Sorry to hear about your sudden loss. Not worry, old posts are fine.. just send me a link to it when you able to and I’ll promote it. No rush, whenever good for you. Thank you. Gramms was the best. Here’s the link. The review is up and can be promoted any time. When best for you, can add it to today’s post or tomorrow. Your call. Will add this to tomorrows post, as off to bed here soon. Sending my best wishes. No problem fashionably early is fine with me! You’ll get top billing! Not sure what I’m going to do, but I’m going to try and find something. Great idea! Oooh, nice! If I can swing it, I’d love to contribute a post on her performance in Charlie Chan and the Curse of the Dragon Queen! If and when I write it, do I just share it here on your blog, in the comments? Just send me a link when you publish it and I’ll add it to the post when I get it. Whats the name of your blog so I can add you? I contributed to the recent Reel Infatuation Blogathon, not sure if you were part of that or not. Anyway, thanks! Thanks! Yes was in that one, I’m more than a bit hooked on blogathons. I reviewed Deckard Shaw (Jason Statham) in the Fast and Furious films. Who did you post about? Oh, and my Twitter handle is @EarthTwoMike – I’m going to look for you there and follow you! Cool! If you look up my blogathons pages here got a whole list of those coming up if you wanting to join some more. I’ll add you to my Twitter now too. Gill, I’ve made up my mind: I want to write about Valley of the Dolls, compariong the book and the movie! Hey Gill. I’m just dropping by to invite you to my newly announced blogathon. Here is the link below. Thanks for the invite! Will check his filmography out then get back to you!!! He’s done a lot of fabulous films. Has anyone claimed Whey You Comin’ Back Red Ryder yet? If not, pencil me in. Will add you now, looks great and such a obscure cast! Reviewed Gortner in Starcrash. Hey I finally discovered I did see some of her movies lol! Will add you now – funnily enough reviewed that my self as a guilty pleasure! Look forward to hearing your thoughts on it! I can do another episode of Sports Analogies Hidden in Classic Movies for Airport 1977…if nobody else claimed it yet. Will add you to the list now, reviewed her in that myself she is fabulous in it. Looking forward to reading your take on it. She was marvelous in her small role, in ‘In the Heat of the Night’ (1967), wasn’t she? Of course, it’s an out and out Sidney Poitier film. I’ll have to get back to you, on what I’d like to do, for this Blogathon. You are welcome to write about her on that if you want, think its still up for grabs.. you’d be the third duplicate! Shall I add you for this film? If you want me to add it now you can always change it. Think its on 2 duplicates now and we allowing three. Ok then, add me for now!! Certainly, great to have you join in with this post.. will add you now. Are you doing that as well as In the Heat of the Night or instead of that film? Cool, will alter that now and tell Angelman’s Place! Thanks!! For some reason I can’t comment on Angelman’s Blogspot!! No problem! Will mention that to him. can i also do portnoys complaint and divorce american style? Sure Rob that’s you put down for all three! I’d like to work up something on Lee’s guest appearance on Ironside in Eat, Drink and Be Buried from 1967. That sounds fantastic! So happy you joining us! The Swarm or Omen II if possible! Great choices, both are still free! Reviewed them both here if it helps you decide! Tell me asap which you’d prefer or if both as films going fast! No problem, consider it yours! I’d like to pitch for “In The Heat Of The Night”, please! Awesome! I’ll do Teachers from 1984. I haven’t seen that since the ’80s, so I’d love to revisit it. Fantastic Paul! Great you joining in! Great idea for a blogathon. I’d love to write about her appearance in the Columbo episode Ransom for a Dead Man, if possible. Thanks. Of course! Was going to message you now its official but you’ve beat me to it! My phone was in my hand when I got the post notification, so it was lucky timing! Thanks again. Can I do “Middle of the Night” for The Stop Button? Certainly, will add you now!